Find out the fascinating stories behind some of the favourite film scores from the 80s, including classics such as John William's E.T., Ennio Morricone's The Mission and Mozart's Amadeus. John Williams and Steven Spielberg formed a particularly strong collaborative bond during Close Encounters of the Third Kind in 1977, and it continued in to Spielberg's absolute classic, E.T. 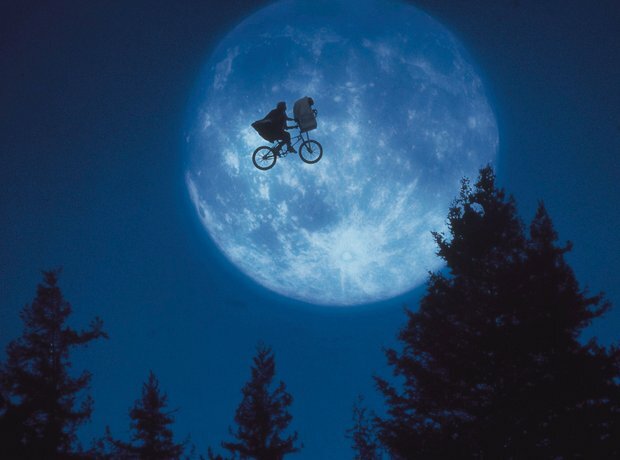 So taken was Spielberg with Williams' music during the iconic bike-chase sequence of the film that Spielberg actually edited the sequence to suit the score! John Williams would go on to win a Grammy and a BAFTA for his score, which sees Williams at his absolute best, with a theme that perfectly captures the childlike thrill of Spielberg's most heartwarming tale. It says a lot about the ability of John Barry that even in a film that's not, shall we say, so well received, his music is almost enough to redeem it. This is arguably the case with Jerry Jameson's 1980 big-budget Raise the Titanic. The film was both a critical and financial flop (Lew Grade, one of its major backers, is famously said to have remarked that it would have been cheaper to lower the Atlantic Ocean), but many critics agreed that the film features one of John Barry's finest scores, and the styles used would later inform Barry's Oscar-winning efforts for Out of Africa and Dances With Wolves. Japanese composer Ryuichi Sakamoto gained international fame for Merry Christmas, Mr. Lawrence. Not only did he write the music, with the main theme and 'Forbidden Colours' proving particularly popular, but he also starred in it alongside David Bowie and Tom Conti. The film tells the story of four men in a Japanese prisoner of war camp during the Second World War, based on Laurens van der Post's experiences during World War II as a prisoner of war as depicted in his works The Seed and the Sower and The Night of the New Moon. The second Star Wars film would go on to become one of the most memorable moments in cinema, not just for THAT ending, but also the introduction of yet another superb John Williams theme. In the Imperial March, Williams created the ultimate theme for one of cinema's greatest ever villains, and it's since been used by politicians, comedians, musicians and TV presenters the world over. The work was premiered on April 29, 1980, three weeks before the opening of the film, on the occasion of John Williams' first concert as official conductor-in-residence of the Boston Pops Orchestra. As well as the classic 80s sound of Huey Lewis and the News, and Michael J Fox astonishing a room of 50s teenagers with 'Johnny B. Goode', Robert Zemeckis' time-travel adventure also featured a grand, epic score from Alan Silvestri. Zemeckis advised Silvestri to write a particularly grand score, despite the film's small scale, to impress producer Steven Spielberg, who wasn't taken with Silvestri's previous effort for Zemeckis on Romancing the Stone. As if impressing Spielberg wasn't pressure enough, Silvestri didn't begin recording the score until two weeks before the film's first preview. Great Scott! Samuel Barber's Adagio for Strings - originally arranged in 1938 - is Barber's most popular piece, to the point where he is known almost exclusively for it, at least among the general public. But it was only when Oliver Stone reused it to renewed and dramatic effect in Platoon that it was brought to a mass audience. The incredible slow-mo images of the torching of a Vietnamese village and Willem Dafoe running from a hail of gun-fire gave Adagio for Strings an entirely new relevance, with Barber's violins echoing the screams of lost souls and the brutality of war. Ennio Morricone wrote one of his most lyrical scores for The Mission, a 1986 British drama about the experiences of a Jesuit missionary in 18th century South America. The standout moment is 'Gabriel's Oboe', a lilting two-minute masterpiece which manages simultaneously to be both lyrical and stately. The piece has been arranged for cello, organ, even a four-piece boy band, and has also become a very popular piece at weddings. Morricone was honoured with both a Golden Globe and a BAFTA for The Mission, with an Oscar still eluding him until an honorary academy award in 2007. If you set out to make a film about Mozart, you can at the very least guarantee that the film's music is going to be something special. Miloš Forman's acclaimed biopic featured many of Wolfgang's finest works, including his Piano Concerto in E Flat, Requiem, Marriage of Figaro and Mass in C Minor. All the music was performed by the Academy of St. Martin in the Fields, conducted by Sir Neville Marriner, with solo turns from Ivan Moravec, Imogen Cooper and Thomas Bloch with The Brussels Virtuosi, conducted by Marc Grauwels. A BAFTA win and Oscar and Grammy nominations were Maurice Jarre's reward for his work on Witness, Peter Weir's thriller starring Harrison Ford and Kelly McGillis. Maurice Jarre's use of synthesisers in this score appears to be an unusual choice of soundscape for such a film, but it seems to enhance the otherworldliness of the Amish community. The simple thematic ideas come together in the barn building sequence, which emphasise feelings of early America and the community work ethos. A celebration both of childhood and the medium of film, Giuseppe Tornatore's 1988 drama Cinema Paradiso has become one of the most cherished slices of world cinema in recent years. In keeping with the film's study of a relationship between a child and a father-figure, Ennio Moricone collaborated with his son Andrea for the film's score. The two originally first wrote music together for a series of Italian crime dramas called Ultimo, before their work on Cinema Paradiso won them a BAFTA. Peter Greenaway's curious British Murder Mystery, released in 1982, is set in 1694 (during the reign of William and Mary). Charged with capturing the spirit of this period through music was Michael Nyman, who composed new melodies based on a series of 'grounds' by Henry Purcell. The goal was to create a generalized memory of Purcell, rather than specific memories, so Michael Nyman based his melodies around more obscure Purcell works, although the first music heard in the film is, in fact, a bit of Purcell's song, "Queen of the Night". Brilliantly, Purcell is credited as a "music consultant." on the film, surely the oldest ever member of a film crew! John Williams was nominated for an Academy Award and a Grammy for his score for Born on the Fourth of July. Part of Oliver Stone's 'Vietnam Trilogy' (alongside Platoon and Heaven and Earth), Born on the Fourth of July was co-written by Stone and Ron Kovic, the man whom Tom Cruise plays in the film. Due to the heavy use of popular songs from the 50s and 60s, only around 25 minutes of John Williams music appears in the film, however it's another fine edition to Williams' cannon, with typically lush strings and heroic brass throughout. For the third and final instalment of the original Star Wars trilogy, John Williams once again teamed up with the London Symphony Orchestra to deliver a lush and epic score. Although lacking anything as timeless as the Imperial March, such moments as Parade of the Ewoks and The Forest Battle mark Return of the Jedi as yet another extremely strong John Williams score. Like the two Star Wars films before it, John Williams was nominated for an Academy Award for his work. Claude Berri (pictured) directed three of the biggest French film stars of the period, Gérard Depardieu, Daniel Auteuil, and Yves Montand (one of the last roles before his death) in Jean de Florette, an historical drama set in rural Provence, where two local farmers scheme to trick a newcomer out of his newly inherited property. Although featuring music by Jean-Claude Petit, the film's score is mainly based around the music of one Giuseppi Vedi. The aria Invano Alvaro from the Italian master's opera La forza del destino can be heard throughout the film. Director Hugh Hudson took a great leap of faith when he took on Vangelis to compose a synthesiser-heavy score for his classic film set in the 1920s. The stark contrast between the film's setting and modern score would very much pay off, with Vangelis producing one of the finest film themes of the 1980s.